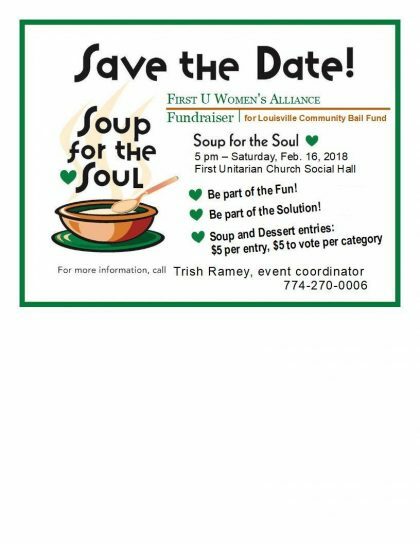 Join with the Women’s Alliance to raise money for the Louisville Community Bail Fund, a group that helps low-income folks stay out of jail, have their day in court and gain a chance to prove their innocence instead of copping to a plea, just to stay out of jail. Oh, and you’ll have a lot of fun, great soup, and fabulous desserts! Funds raised will go to the Community Bail Fund, a sponsored organization of BLM Stand Up Sunday. Soup and dessert entries $5 per entry, $5 to vote per category.